Buy books and manuals! 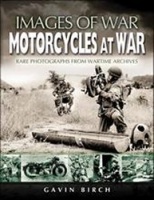 Go to Military Vehicle and Motorcycle Shows and take lots of photographs.... Get in touch with other owners, join a Club or search the internet for more information and BUY BOOKS! You can never have too much information! 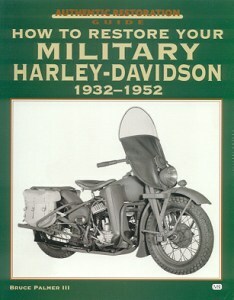 The basic books for every WLA enthusiast are Bruce Palmer's restoration guides..... The big book first came out in 1994 and was recently published as a second edition. 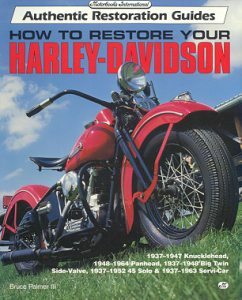 It is filled with interesting information on how to restore vintage Harley-Davidson motorcycles. 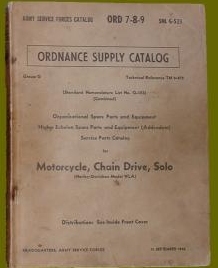 US Army Technical Manuals including the Fort Knox Motorcycle Mechanic Handbook and TM10-1482 Parts List as issued with Type III, IV and early V 42WLAs. Lower left is the Uncrating and Assembly Instruction issued with each crated WLA. 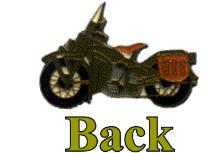 It lists all parts groups and has detailed images of all sides of the Motorcycle. 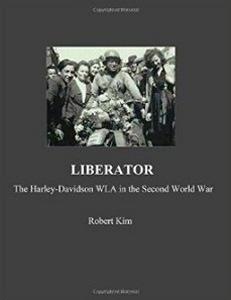 In recent years several books have been published about the 42WLA Model and various general Harley-Davidson related books have photos and information about the WLA. Even if it's not a pure military book, sometimes the pictures showing finish, tires and other details make it worth purchasing. 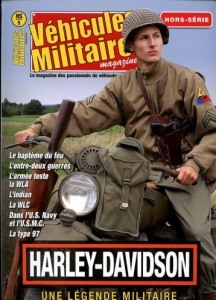 Sometimes WLAs appear in motorcycle magazines, so a visit to the book shop from time to time is worth your time. 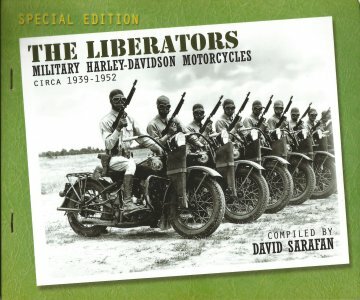 Of special interest amongst the books shown is David Sarafan's 'Liberator' book (middle). 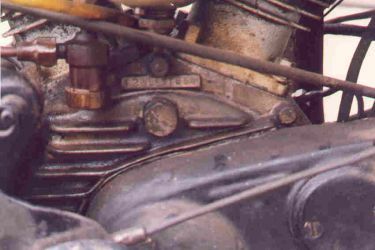 Something to consider when buying a restoration project is to be sure you have a correct engine number. 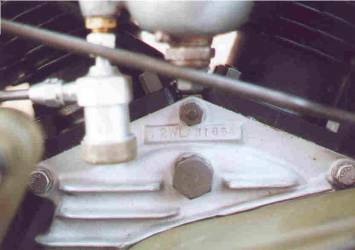 Originally WLAs do not have a frame number and are identified by the engine number only. 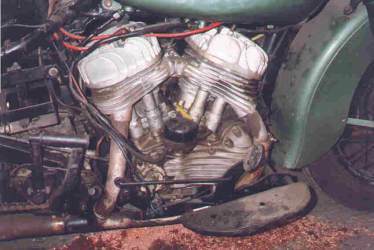 An incorrect engine number may cause problems if you ever decide to sell the bike! 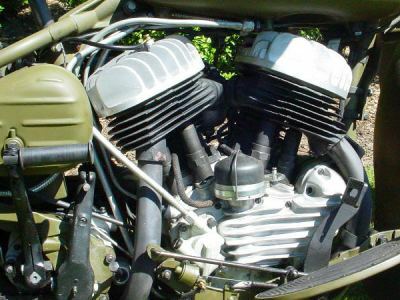 If you want a WLA, then do not buy a WLC.... A WLA with a WLC engine or other WLC parts will never be a true WLA and you will never be happy with it. A WLC deserves to be restored to WLC Specifications. There are hardly any nice restored WLCs around. 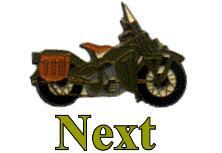 After complete dis-assembly of the bike, make an inventory of what you have and what parts are missing. Make a list of what you need to purchase. 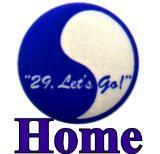 Try to restore or overhaul one item at the time. Do not throw all loose parts in one box, but organize your work. Restore one item or group at a time and make sure each part is properly painted and finished before you start on a next object. Pack each finished item away with the correct nuts and bolts or other hardware; this will make it so much easier when you start assembling your bike. 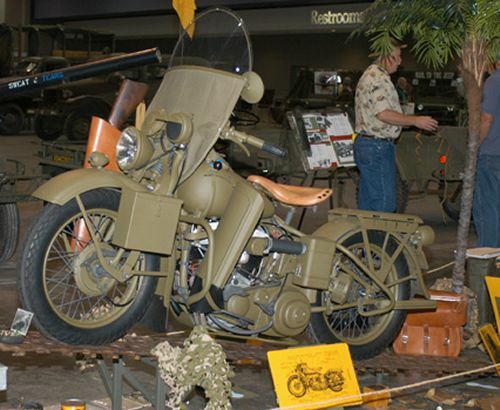 Roughly 60.000 WLA motorcycles were made during WW2 with additional spare parts to assemble another 30.000. 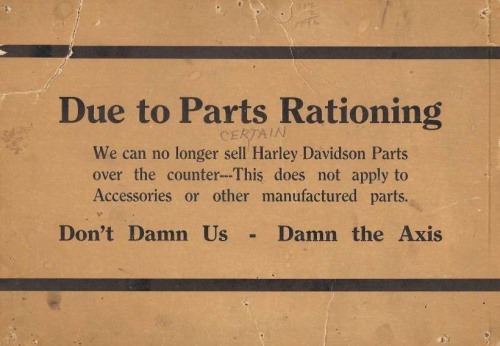 Just about the entire Harley-Davidson part inventory went to the Military during the war which resulted in rationing parts for civilian use. The above pictures show a variety of labels, wrappers, boxes and a crate containing WLA Spare Parts. 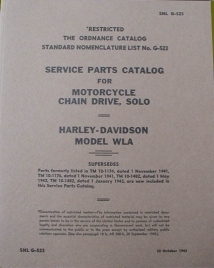 The crate bears the number G-523 indicating the Harley-Davidson WLA Model and contained 100 Valves. 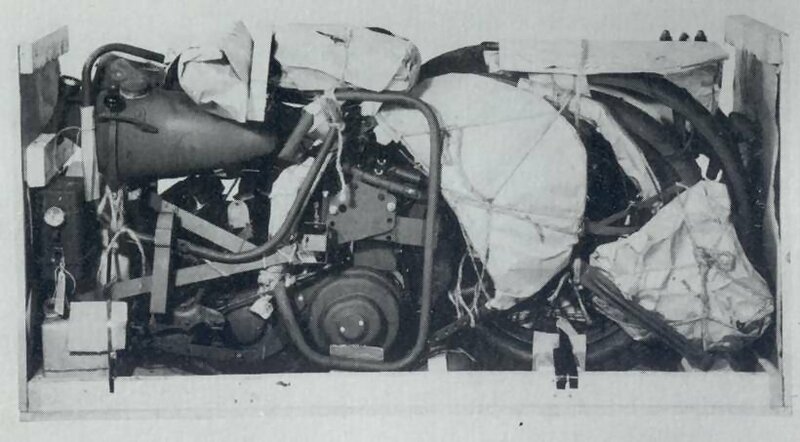 It was repacked in 1956 and was supplied to a European Nation under the Mutual Defense Assistance Act of which the paper logo is visible on the crate's upper right corner. 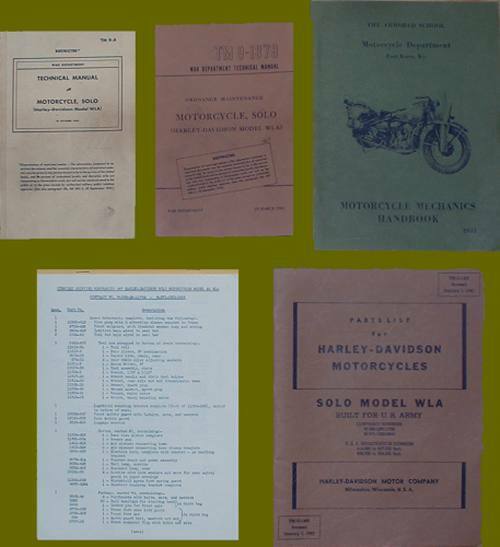 Luckily thousands of those original, NOS (New Old Stock = Original Unissued/Never Used )spare parts have survived and are now available from specialised dealers, Ebay, swap meets and flea markets. Furthermore most parts are now being reproduced. 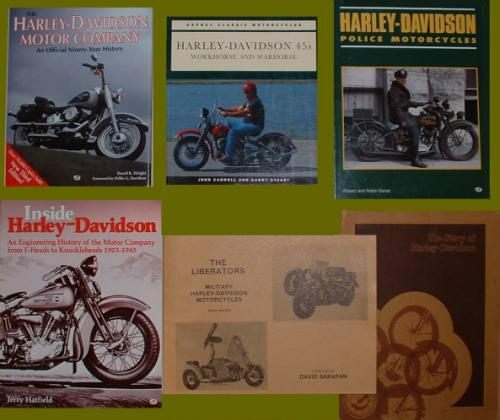 It is important to understand the Harley-Davidson parts numbering system to know exactly what part you're looking for. You will need a Parts List or US Army Ordnance Supply Catalog SNL (Standard Nomenclature List) G-523. 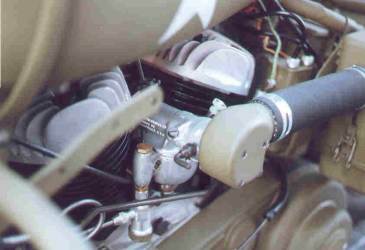 These list all parts with their original HD Part Number, which makes it easier for you to explain what you're looking for and will help you determine what part is packed inside that brown sticky lump of cosmoline, identified only by a paper tag stating a number in typical Harley-Davidson style. These superseded Parts List TM-10-1482. HD Part Numbers follow this pattern: 1234-40A. The first numbers in the part number is the part itself. The numbers after the hyphen indicate the year it first came out. If this part has a letter following the indicated year, then it would still be the same part but with an upgrade of some kind. Upgrades are generally indicated by letters A, B,C, etc and specific military equipment is indicated by the letter 'M'. 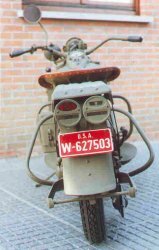 Part 3702-40M is Mudguard,Complete,Front as used on the 42WLA until approximately 42WLA53000 when the second pattern Mudguard was introduced. This was Part 3702-42M since it was designed or approved in 1942. Part 3571-37A is the Pipe, Oil Pump Feed introduced in 1937 and the A indicates an upgrade. 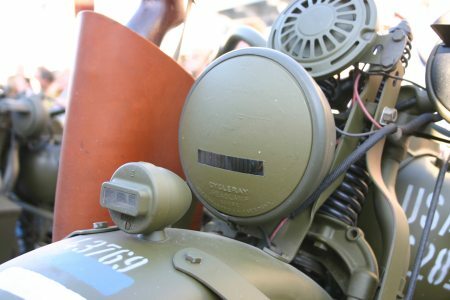 The Gas Tank has number 3502-40BM which means the tank used on the 42WLA was introduced in 1940 and has since undergone changes to fit the 42WLA (Letters 'BM'), but the military tank 3502-40BM will also fit all models that were originally equipped with the standard tank 3502-40. Hypothetically, if the part number were to change from 3502-40BM to 3502-95,this would mean it changed so dramatically starting in 1995 that you must use that part from 1995 to present while the -40BM number would fit 1940 to 1994 models. 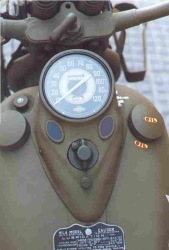 A typical example of a Spare Parts' Tag which was attached to an original front mudguard leather flap. 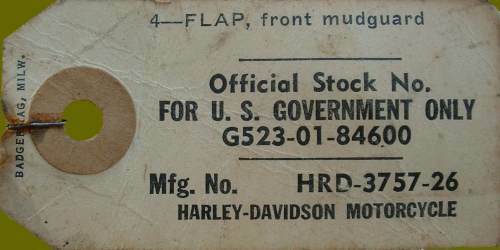 These labels show both US Govt Stock Number (G523-01-84600) and the Manufacturer's Part Number as described above (HRD-3757-26). Note the tag was made in Milwaukee by a sub-contractor. Nuts, bolts, washers (common hardware) do not fall into this part number system. They typically have numbers only (i.e. part number 0207 is a washer) with only some exceptions having a letter suffix. Using the correct part number will help you search dealers' catalogs and buy the correct part. It will make it easier for a parts' dealer to know what you're looking for and make for swift and easy shipping of parts. Parkerized, Cadmium Plated, Olive Drab Paint,....... You will come across all of these terms during your restoration process. Upon delivery from the factory, each part had its own specific finish. 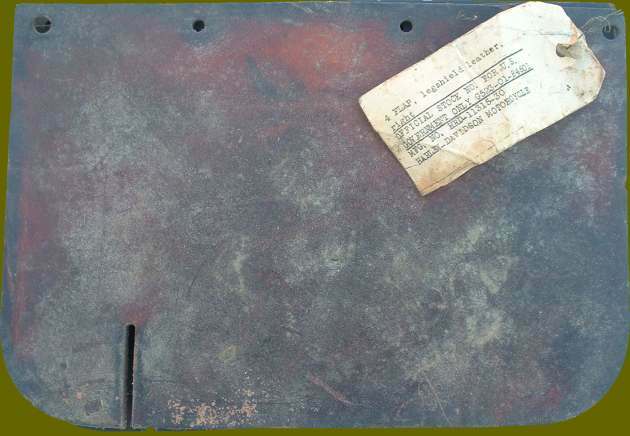 Looking at original WW2 photo's can tell you which part has which finish and Bruce Palmer lists the correct finish for every part of every type in his military book. This alone is reason enough to get that book. 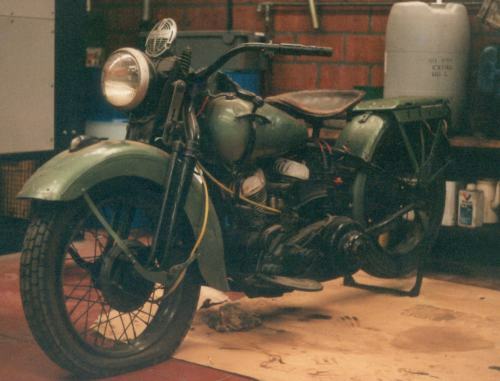 For a Factory-Class restoration, all parts need to be finished in the correct shade or color. 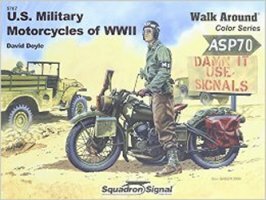 Of course WLAs were no show bikes, so there were no chrome parts. Metal parts were either parkerized or cadmium plated. Depending on which type 42WLA, similar parts had a different finish. 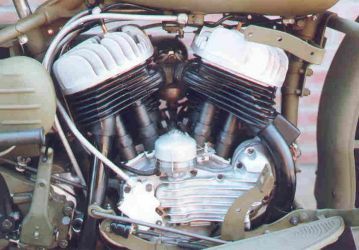 Other parts were either natural finish, bright nickel plated or painted in different colors (Olive Drab, Silver, White...). 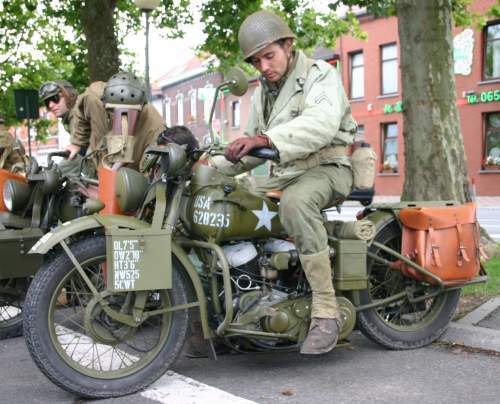 All WW2 WLAs were painted Olive Drab, even those supplied to the US Navy and US Marine Corps. 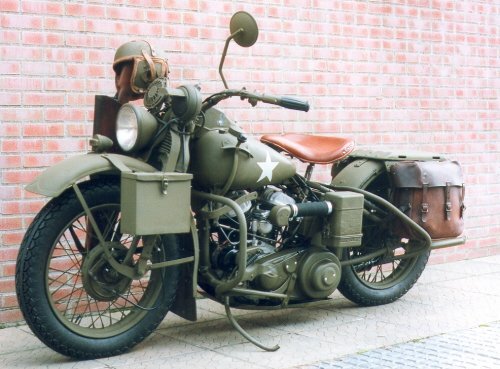 Like on most pre-war US Army vehicles; up to and including the 40WLA, the olive drab paint used was a high gloss color (QM Specification ES-N°362, Enamel, Synthetic, olive drab, high gloss) but from the 41WLA onwards, the paint used by the US Army in WW2 was absolutely flat (QM Specification ES-N°474, Enamel, Synthetic, olive drab, lusterless flat)! 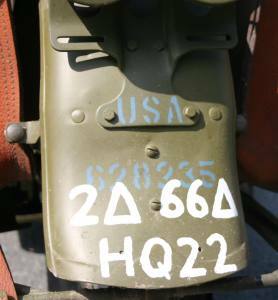 This type of paint is available from most military vehicle parts dealers and is very easy to work with. A lot of restorers do not like it because it's difficult to maintain and scratches easily. Personnaly I love the way it ages and after a couple of years it has that original look. The Blue Drab 'S' was painted with Humbrol PRU Blue Modelling Paint. Of course parts that are not painted are more prone to rust. 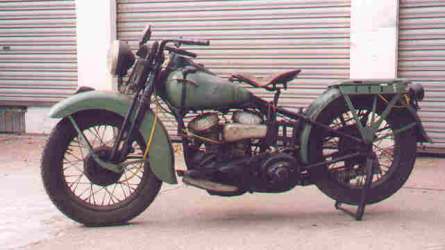 A bike that is ridden regularly in all kinds of weather will have more painted parts than a show bike. Also a repainted original part is sometimes preferred over a parkerized or cadmium plated reproduction part. It has become harder and harder to find companies that still refinish parts in the correct manner, especially in Europe. Bruce Palmer describes a method of DIY parkerizing in his big book, but I know from experience it is not that simple!! Even if not every part has the factory-finish, a realistic mix of painted and parkerized or cadmium plated parts gives your bike that original look. 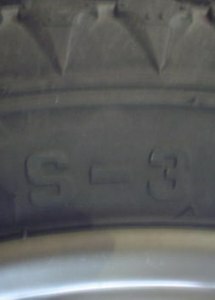 Although difficult to make out, it seems the front tire isn't the Firestone Sportsman type but rather the Firestone All Non Skid (ANS) type. 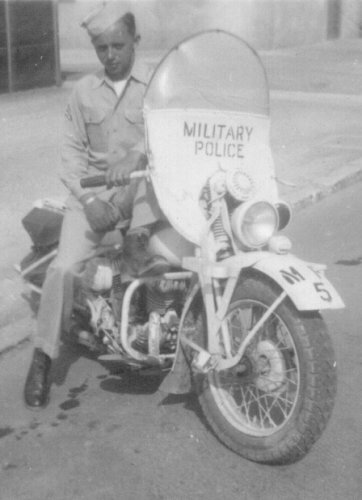 Sgt Hugo Arne, a Military Policeman with the Fort Benning Motor Squad, poses on a WLA. 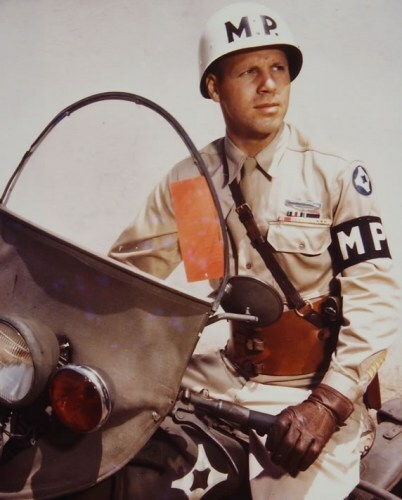 Sgt Arne served with the 32nd Infantry Division for 32 months in the SouthWest Pacific earning a Silver Star during that period. 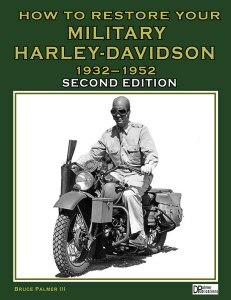 He served as a rifle squad leader and later with the Division MP Detachment through the New Guinea and Leyte Campaigns. He wears the tan cotton service uniform with 4th Service Command patch on his shoulder. He tops off his uniform with a leather kidney belt and a revolver in a shoulder holster. 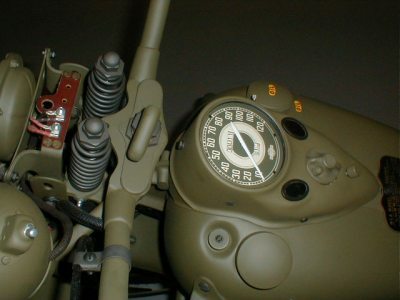 On the bike, the Black out Driving light has been replaced with a chrome red pursuit light and the insignia of the 4th Service Command has been painted on the tank. 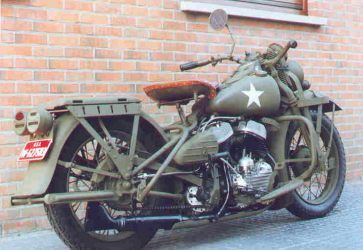 Interestingly, visible hardware seems painted olive drab, especially the round head screws holding the luggage rack to the rear fender. Food for discussion on the correct finish of bolts and nuts..??.. 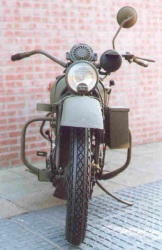 At the end of the war, when Traffic Control and visibility became more important than tactical conditions, several Military Police motorcycles were repainted in white. An MP from an unidentified MP unit poses on a Type III WLA on which white paint was probably applied with a brush. Only minimal parts were left in the original finish (grips, tires, saddle and saddle bags). Even the engine, and exhaust bear traces of burned off paint. The Black out Driving light has been replaced with a red pursuit light and Military Police markings have been added in black. Inspiration for someone's future restoration project..??.. How many items can you spot? 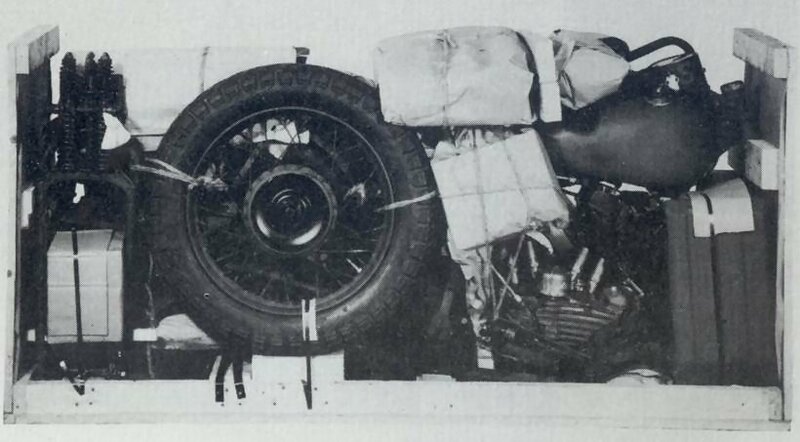 As described earlier, WLAs left the factory fitted with Firestone Sportsman Tires in 400-18 size. 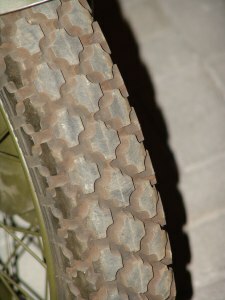 These original tires are extremely rare and are not safe to ride anymore. 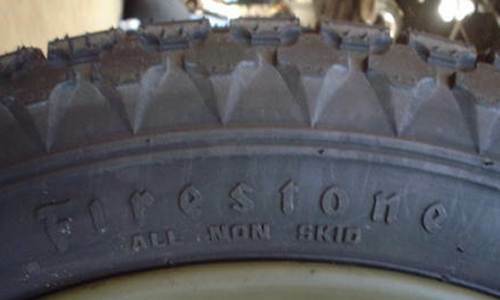 However for those that prefer a more authentic look, the Coker Tire Company now sells a reproduction Firestone All Non Skid (ANS) type tire. 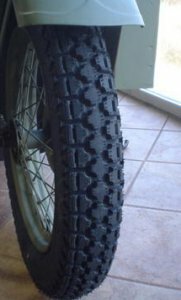 Compared to Sportsman Tires, it's slightly different as the Sportsman has two extra rows of cross-lugs, but the ANS looks very convincing. 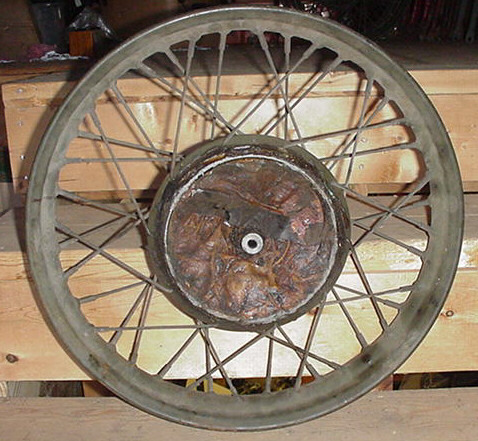 An original wartime Firestone ANS tire, was found on a pre-war French Army Indian CAV-340 by Martin Bogaert a couple of years ago and the same type may well have been used on WLAs too. 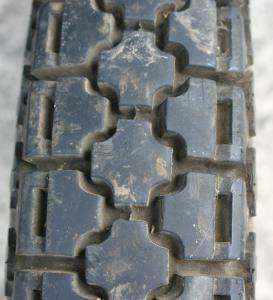 Coker also makes a very nice Good Year 'G3' Deluxe All Weather tire. Right: Martin Bogaert's original Firestone ANS Tire from an Indian CAV-340 delivered to the French Army in 1940. It is being accurately reproduced by the Coker Tire Company. Phil Suttile fitted the Coker-Firestone ANS-tires to his Type IV and they look really good! 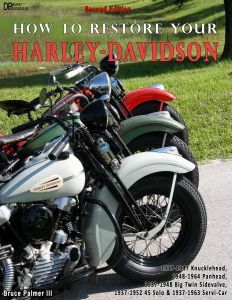 Original leather saddlebags have become very hard to find, especially in usable condition. They are therefore very expensive. The leather seat on the large solo saddle is usually completely worn out. It is difficult to repair as leather parts of the seat are sewn together after being riveted to the saddle pan. Again nice reproductions are available. 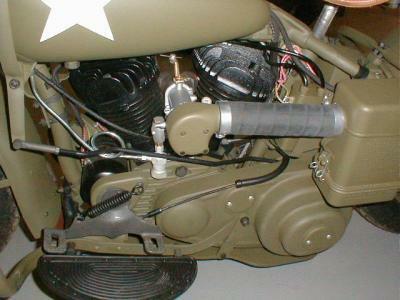 WLA saddles were brown and had three rivets on each side to protect the leather from chafing. WLC saddles did not have these rivets. Leather mudflaps were fitted to the front mudguard and both legshields. These were made from brown cow hide. A set of 4 unissued flaps for the right legshield show the original brown finish of issued leather parts. With age the leather has become rather hard and would probably crack when used for restoration. The parts are identified by the paper tag showing description and number of the part furnished. 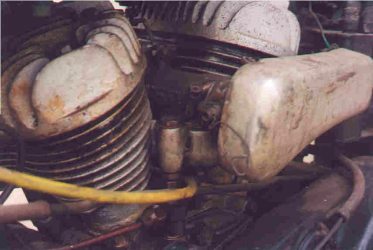 Some truly wonderful restorations are completely ruined by incorrect or excessive markings. 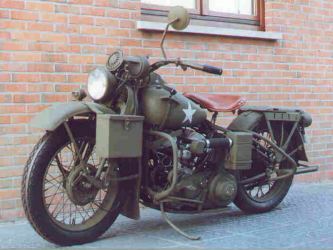 Correct WW2 style markings depend on the time period, unit and theater of operations the restored bike would have been used in. 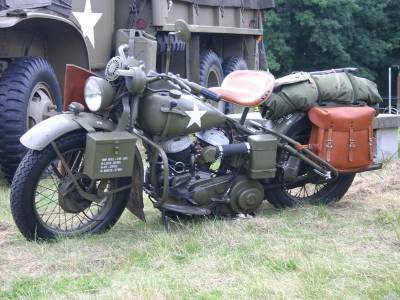 Best is to use WW2 Army Regulations (AR 850-5), Tables of Organisation and Equipment (TO&E), and period pictures as reference to verify which units were equipped with WLA Motorcycles and how markings were applied to them. 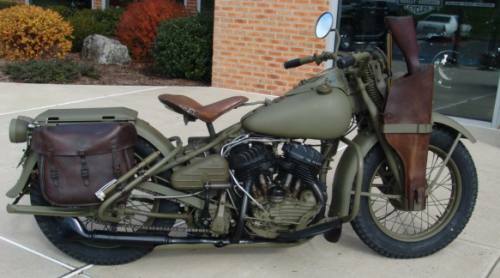 Kent Chipman of Texas restored his Type III WLA using Bruce Palmer's book as reference. The result was outstanding. He won the Best of Show Award at the 2004 MVPA Convention in Mobile, Alabama and was awarded Master Class Winner at the 2006 MVPA Convention at Dayton, Ohio. 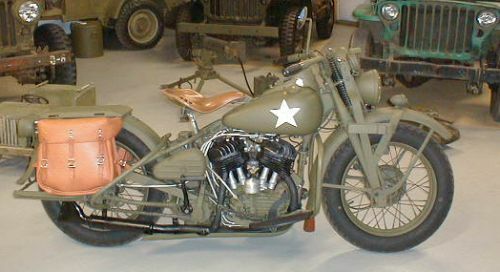 The bike is shown on display below; note the many dull gray parkerized parts. Steve Gregori's Type IV was restored by www.resurrectioncycle.com and the result looks magnificent. 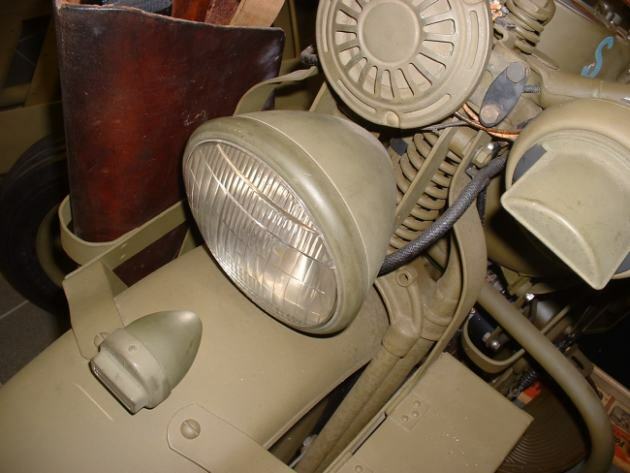 Type III 42WLA35730 was restored to factory-specifications in Belgium in 2005-2006 and at the time these pictures were taken it was owned by the chairman of the Belgian Military Vehicle Collectors Club: Historical War Wheels. 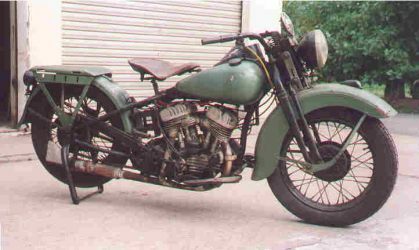 A maximum of NOS (New Old Stock) parts were used and the bike is outstanding.... It has since been sold to an unknown rider. A rather well known WLA restored in Belgium in the early 1980's. 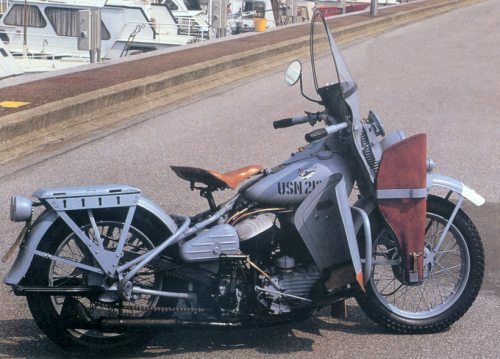 While it's a wonderful bike, the US Navy Gray finish is not historically correct as USN WLAs were obtained in Olive Drab livery straight from Army sources. Living in Europe, I got most of my parts from dealers in Holland. 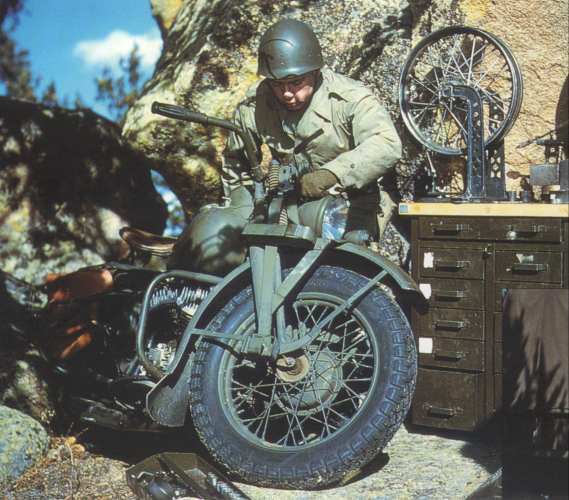 After restoring my GPW Jeep in the 80's, I started looking for a HD WLA military motorcycle. 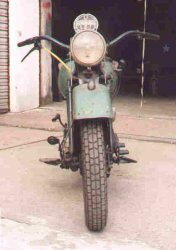 After the fall of the iron curtain in 1989, lots of ex-military bikes from Russia and Poland found their way into European collections and I went to see several of these. Most of these bikes were in very poor condition. Then I located 42WLA31854 in Brussels, Belgium in August 1993. It had started life as a Type III 42WLA in early 1943 (probably in January) and was shipped to Europe where it was to stay. 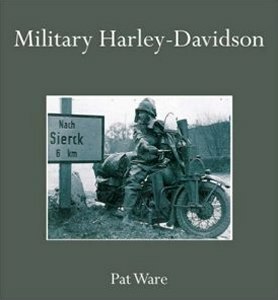 After the war it was 'demilitarised' and used extensively in Belgian civvy-street until about 1975 when it was put aside. 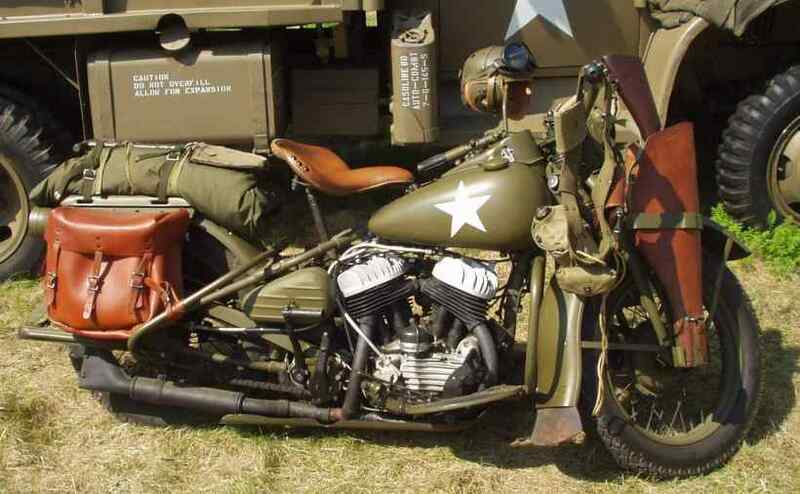 Nearly all miltary equipment had been removed; the bike was fairly original but in need of a complete rebuild. 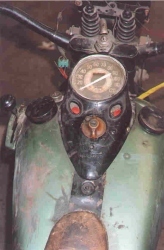 The pictures before restoration were taken on September 5th, 1993 shortly upon arrival at home of the bike and the other ones on May 30th, 1998 following complete restoration. 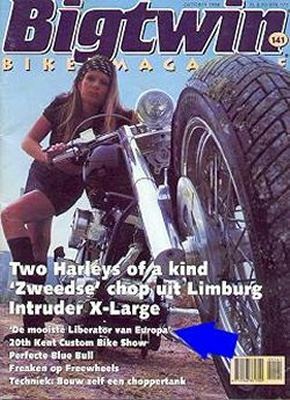 My Liberator was featured in an 8-Page article in the Dutch Motorcycle Magazine 'Big Twin ' Issue 141 of October 1998.